Blimey, she does have some similar things going for her, but sorry its not her this time, good try though the famous son I mentioned now resides in Qatar, does that help? Moniet?? Ive been looking on Allbreeds for info, I would never have got it from the clues as the info is different, if it is Moniet it says she was born 1975 on allbreeds and she doesnt have the same name as her dam. Hi Mad Mazza, you beat me to it by about 3 minutes, I'd just got it when the damned phone rang ! Just out of interest who is the famous son in Qatar? Yes I was Taylor, and I thought the clues I gave apart from the strains were good. well done again mad mazza is that really your name? Thats ok Mike, I was only joking. I realise now that you meant your other boy Azim who is very handsome btw! Here is anothe private photo, so it cant be looked up on the net, but with clues you are sure to get it, I will start with no clues and just see if anyone can recognise them ? Just a wild guess =Carmargue! It's Maleik El Kheil with Daphne Mahoney? 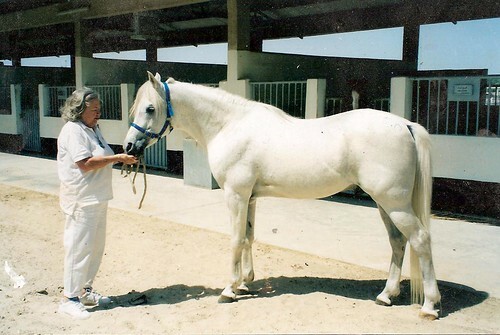 at the Royal Stables in Abu Dhabi, photo maybe taken during the WAHO convention. He has just been gifted to Al Aryam Arabians in Abu Dhabi. I am fortunate enough to have 3 daughters and one son by him, all in England, aged from 3 to 5 years old and the 2 older mares are breeding very well. I have one of his daughters !